A glance back and a look forward! I have been reading lots of “end of year” reflective blogs and I am loving them, but feeling reluctant to write my own. 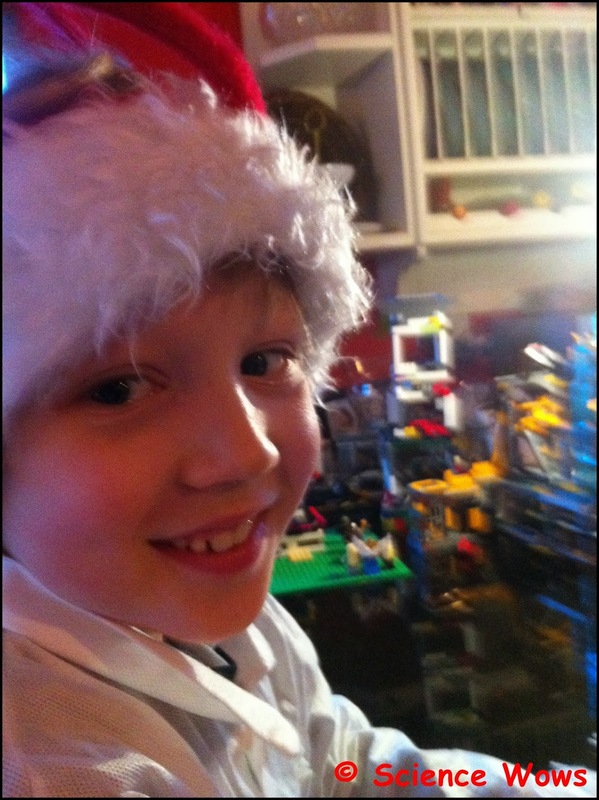 I set myself the challenge at the start of 2013 to write a blog for the year. I had given up making the typical New Years Resolutions a long time ago as they had always fizzled out before January was over. However, when I really set my mind to something I am a bit like a terrier, I just don’t let go. So my resolution at the start of 2013 was a little different… I set myself a year of blogging… a start and a potential end point if I chose it at the end of the year. I also decided to start in the middle of January, not the very first day as I knew that to be the first stumbling block for success for many. One year on and I have done it. I have toyed with different writing styles (did you notice?? ), I have changed design a few times (once completely by accident when I deleted my entire layout! !… I learned how to back up after that one!). I started with the very long, more scientific posts (which I do still love to do from time to time) and moved on to some shorter, more general ones. I started blogging once a week and then increased that. I introduced things like the Mystery Creature spot at the start of the week and the Just a thought posts which have become some of my favourites! I started in that pig headed and totally naive manner that seems to be burnt into the core of my character (just ask my hubby… I think he finds this trait both totally frustrating and admirable all at the same time!). I wrote, I clicked “publish” and then I sat back and waited. Maybe I just expected an automatic audience to come flooding to my words in an “if you build it they will come” kind of way – as I said Naive with a capital N! Turns out it doesn’t work like that… who knew? I have learned a lot about social media through this blogging adventure and in so doing I have met some wonderful people and have been helped, supported and inspired by many. This in itself has made the years adventure so worthwhile. The only disadvantage to my resolute and finite plan to blog for the year is what do I do when the year is up? Now I understand my own reluctance to write this post. I have come to the end and I need to decide the next step. So what to do next?… well I have really enjoyed the writing and have found that I have learned so much on so many different levels. In fact I have enjoyed it so much I am not ready to stop. I feel this blog is still an infant and has a lot of growing to do. It is time to make some changes though… firstly, structural ones… so watch this space as things will get shaken up a little and we will see what the blog looks like when the dust settles. In the mean time if you have any suggestions as to what you might like to see more of on this blog, or less of, just let me know in the comments below. Your feedback would really make a great end to my blogging year and a helpful start to my next blogging phase… so go on… don’t be shy! All that remains now as the year closes in is to say a BIG thank you to all who supported me in my blogging adventure so far. A special thanks to my hubby who has patiently supported me while the dinner got delayed, the laundry (and kids) stayed unwashed and the conversation paused, all until a post was finished. To family and friends who edited, proofed, suggested and cajoled the blog along with me, especially in the early days – my heartfelt gratitude; and to all those who I have met along the way and have offered me such invaluable help, support and advice, thank you all, it is very much appreciated and has not gone unnoticed! We like to get a real tree for Christmas every year, the lovely smell of the pine really adds to the festive feeling! Sometimes we get more than we expected… a few years ago we found a beautiful nest in the tree; this year we found an unexpected visitor… a cute little ladybird. It is likely that most of our Christmas trees are hiding a multitude of insects in various stages of life cycle and hibernation. In fact a recent article suggests up to 25,000 creatures may be found on one tree alone. These can include mites, aphids, beetles and spiders. Many, like our little ladybird, may awaken from their hibernation once they are brought into the warmth of the house. Some in the egg stage of development may hatch but most will just stay resting on the tree and will be none the wiser of their new surroundings, being removed from the house when the tree goes out after Christmas. Even if they do wander from the tree most of these insects pose very little threat to the house or its inhabitants and will often die due to heat and lack of food. This little guy obviously did waken and decided to take a little walk around his new surroundings. We were glad to see him as we had noticed a real reduction in our sighting of ladybirds this Summer, a casualty of our late and hot weather meant a reduction in aphids and therefore a drop in their food supply. Who doesn’t like the ladybirds? Let’s hope the weather is more favourable for these little gardeners friends in 2014. The Harlequin ladybird has invaded Ireland and is a big threat to our 15 native species. Bigger, hungrier and a potential predator this species could really impact the number of ladybirds in this Country. 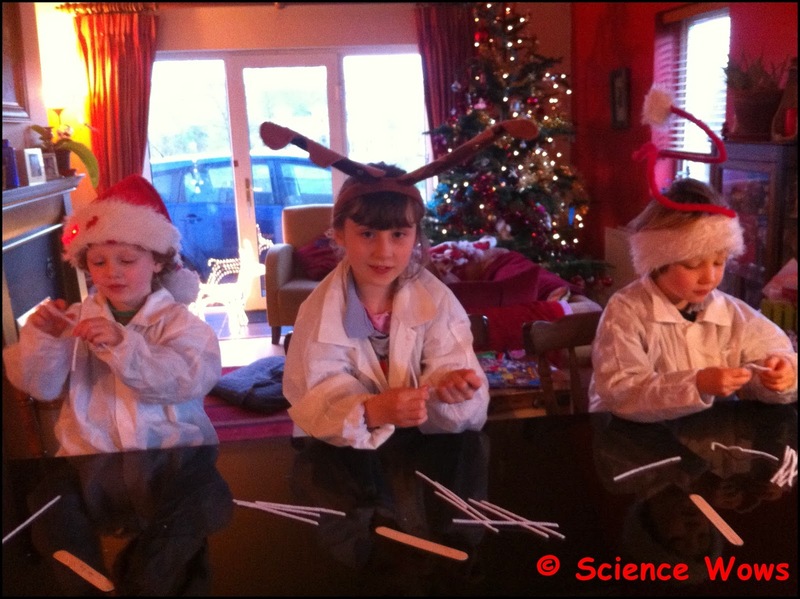 This is definitely one of my favourite experiments…. 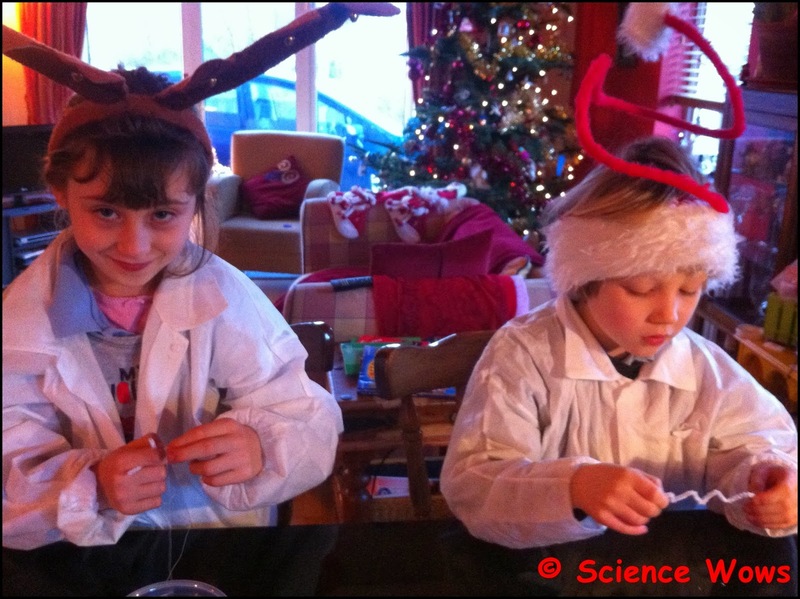 a little bit of science and a little bit of craft… resulting in some beautiful crystal decorations. 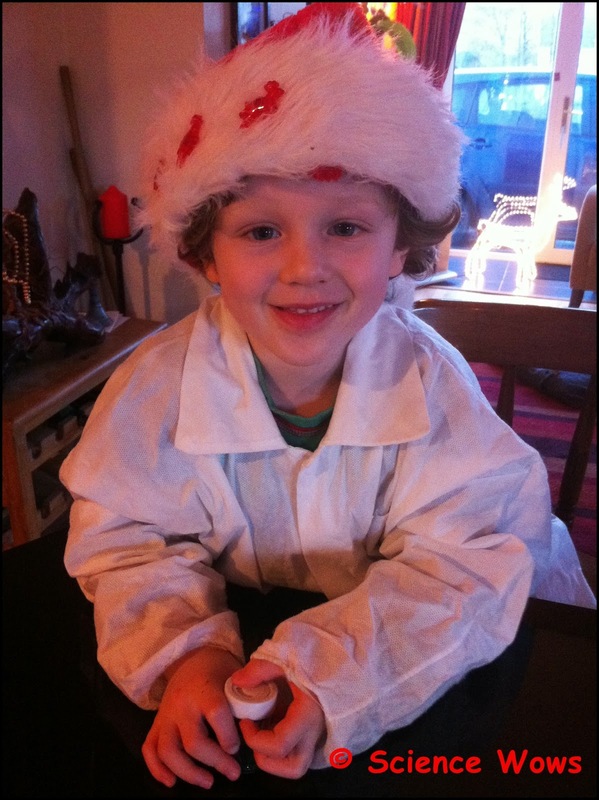 It has become a bit of a Christmas tradition in our house at this stage. Each year we make a new set of decorations to add to last years set, plus they make a lovely homemade gift for family and friends. Adults and children alike… I highly recommend you try this one! 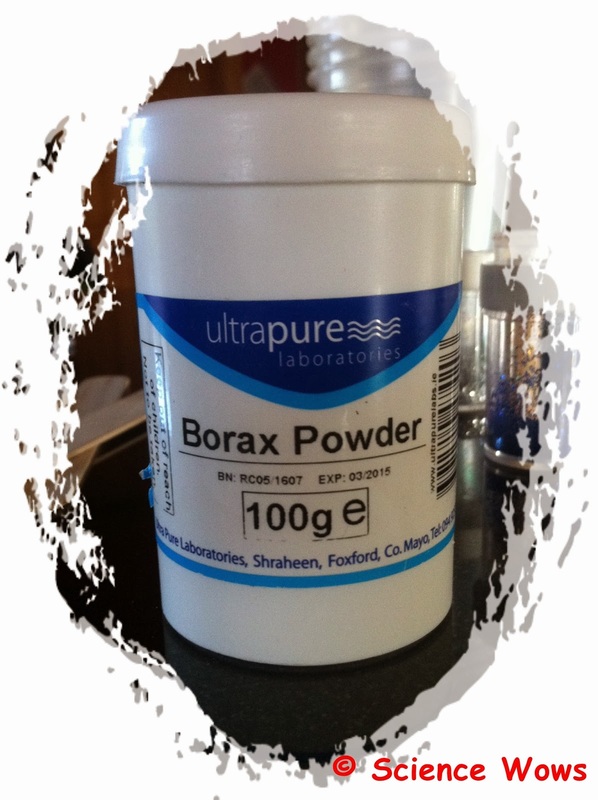 *A little note on Borax powder; you should be able to get this powder in any chemist in Ireland. It will cost anywhere between €2 and €3.50 for this 100 g quantity (which is unfortunately the only size available these days). Borax is classified as non-toxic by the FDA and is a common ingredient in some washing powder and many skin creams. It is therefore considered safe to use with children, if the solution splashes on their skin it will do no harm; although it is classified as non-toxic, I would obviously not suggest that anyone actually eat it! Firstly boil the kettle and pour the boiled water into your jug to cool a little (about 10 minutes is good); this bit is definitely for an adult to do! 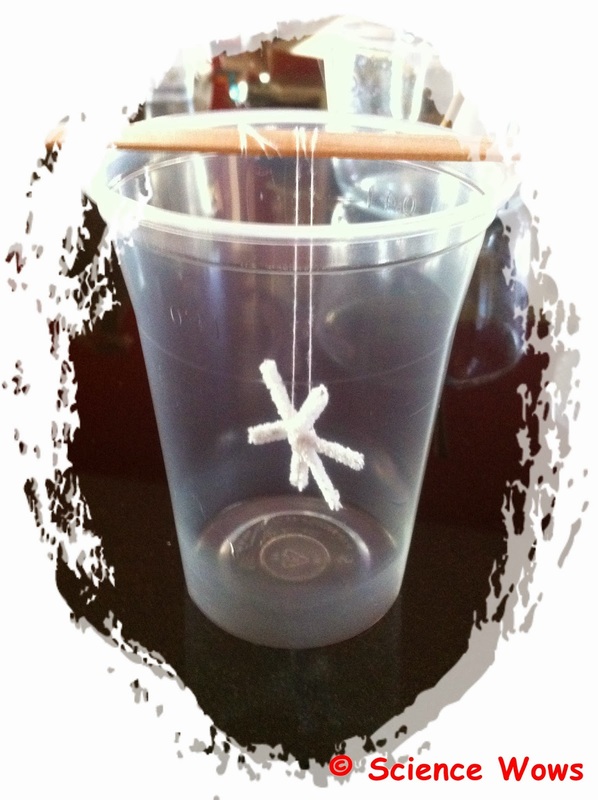 While you are waiting for the water to cool make your decoration out of the pipe cleaners, it needs to be small enough to fit into your plastic cup without touching off the sides. We are going through a phase of making star shapes at the moment, quite appropriate to the season I think , but feel free to be a little more creative! 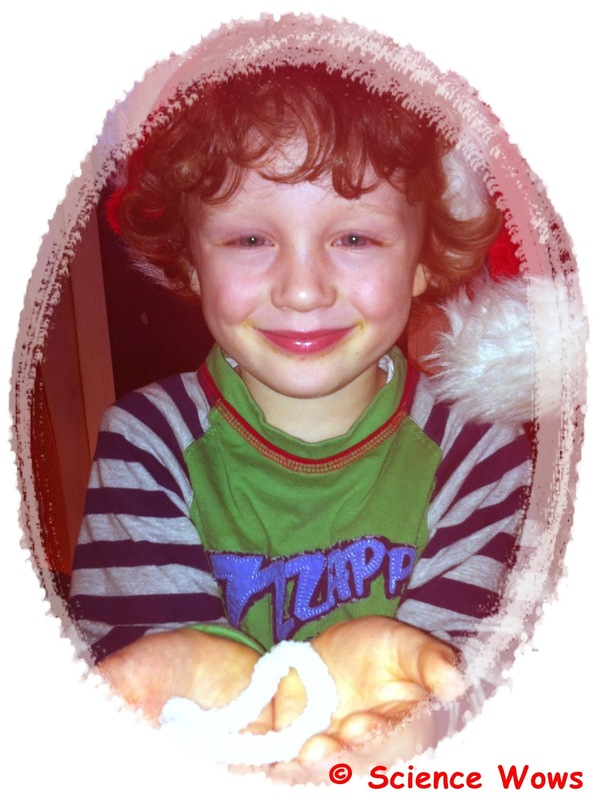 Shape your decoration from pipe cleaners… we love star shapes at the moment! Tie some thread to your shape and tie the other end to the lollipop stick, place the stick across the top of the cup so the pipe cleaner shape dangles in the cup. You may need to adjust the length of the thread until you get it just right. You want to be sure that the shape dangles in mid air and does not touch off the sides or bottom of the cup. 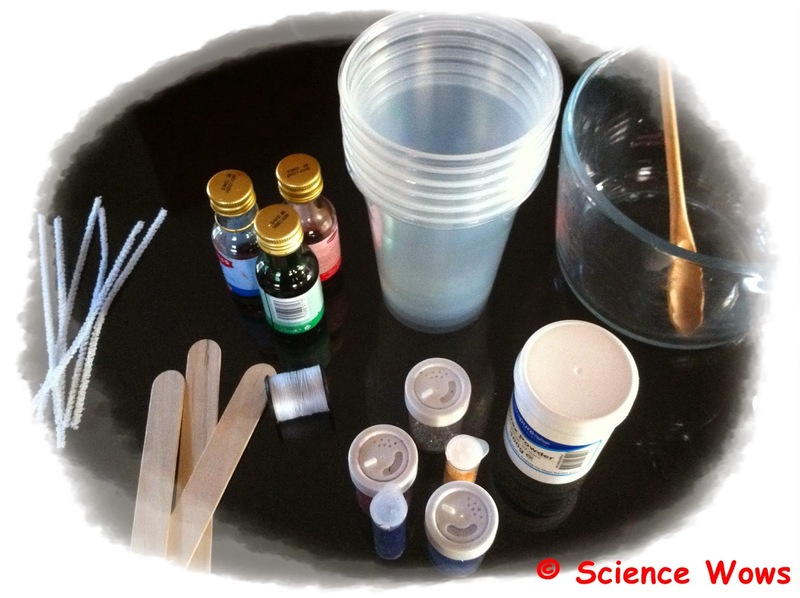 Now it is time to prepare the borax solution… you need to add the borax powder to the hot water and stir it in until no more will dissolve in the water. You will know that you have added enough when some of the powder stays at the bottom of the jug, no matter how much you mix. You will need at least two tablespoons of borax powder in 250 ml of hot water, but I would advise adding more if the powder is still dissolving. 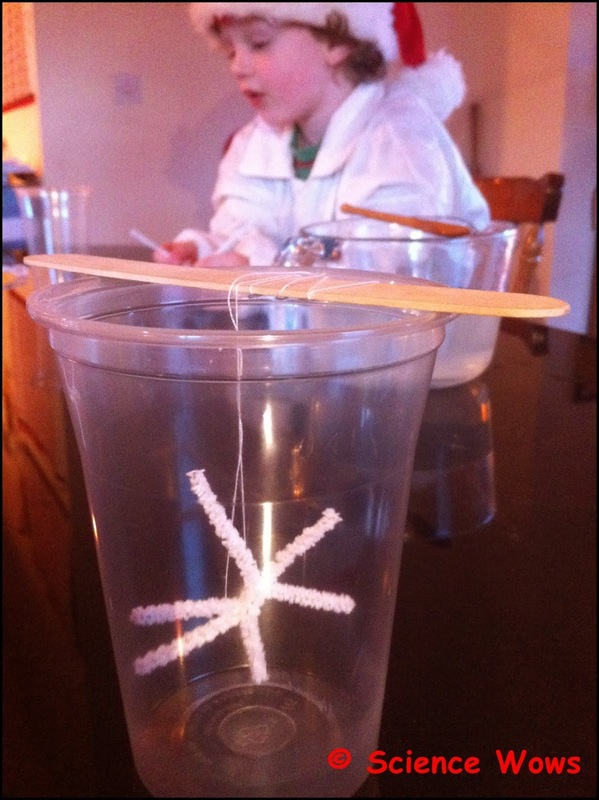 When you are happy that no more powder will dissolve in the hot water then pour this borax solution into the cup making sure you cover the pipe cleaner shape completely. 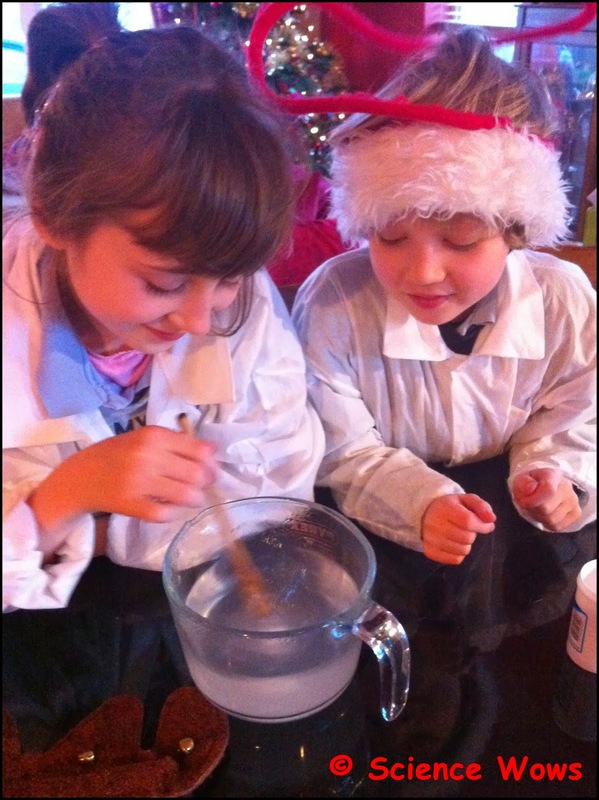 If you wish you can add a few drops of food colouring at this point and mix it into the borax solution. You may also want to add some glitter, just sprinkle a little into the cup. I like to use a fine glitter if doing this step as you don’t want bit pieces of glitter dropping to the bottom of the cup in case the crystals form on them instead of the decoration. If I am adding glitter I sprinkle a small amount onto the surface of the solution in the cup them I lift the stick up and down so the glitter sticks to the decoration. I repeat this step a few times until I am happy that the decoration is covered in enough glitter! And that’s it… all you need now is to leave your cup somewhere safe overnight and wait with patience! 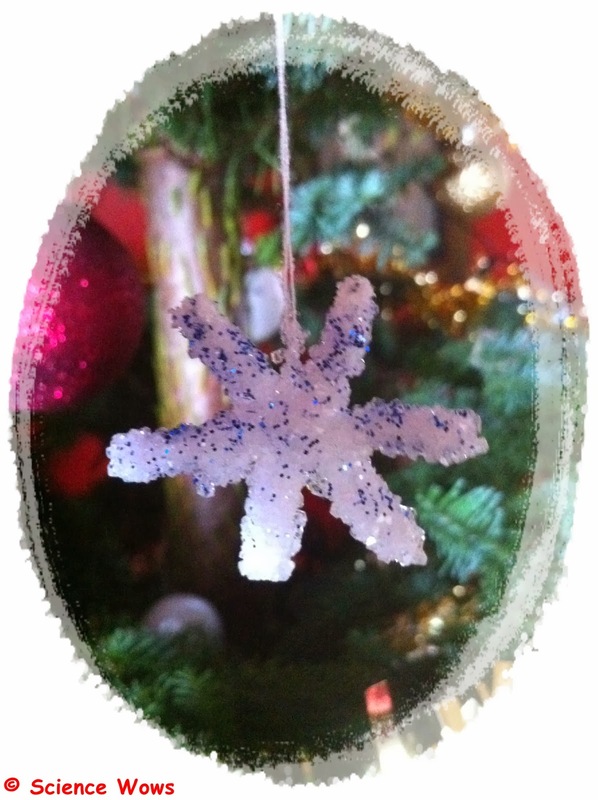 Check it the next day and you will see your decoration is covered in lots of lovely crystals! Remove the decoration from the cup and place on a piece of kitchen paper to dry. This experiment teaches us about making saturated and super saturated solutions and about how certain minerals will form crystals. 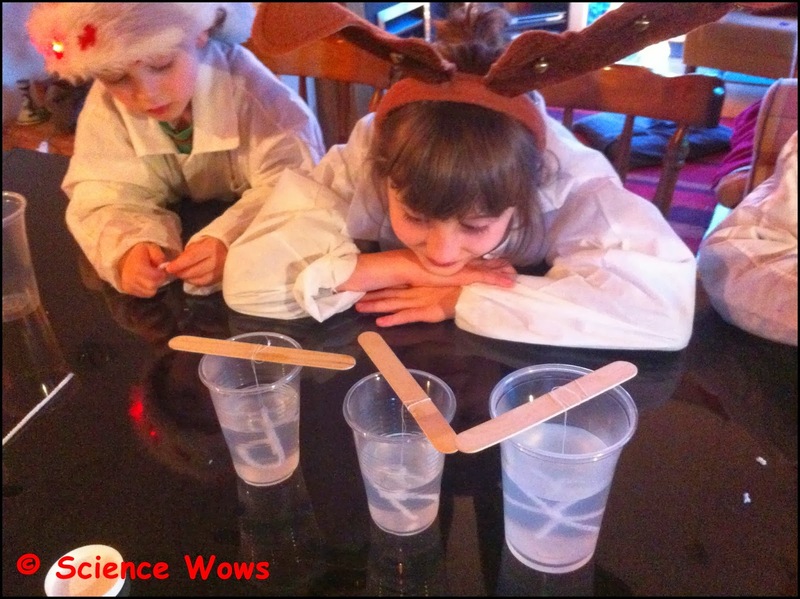 If we dissolve the Borax powder in water until no more will dissolve we have created a saturated solution. The water cannot hold any more of the powder. However if we heat the water it will be able to dissolve a little more powder and this is what we do when we add the Borax to the heated water. When we heat a solution to be able to dissolve more material it is called a super saturated solution! 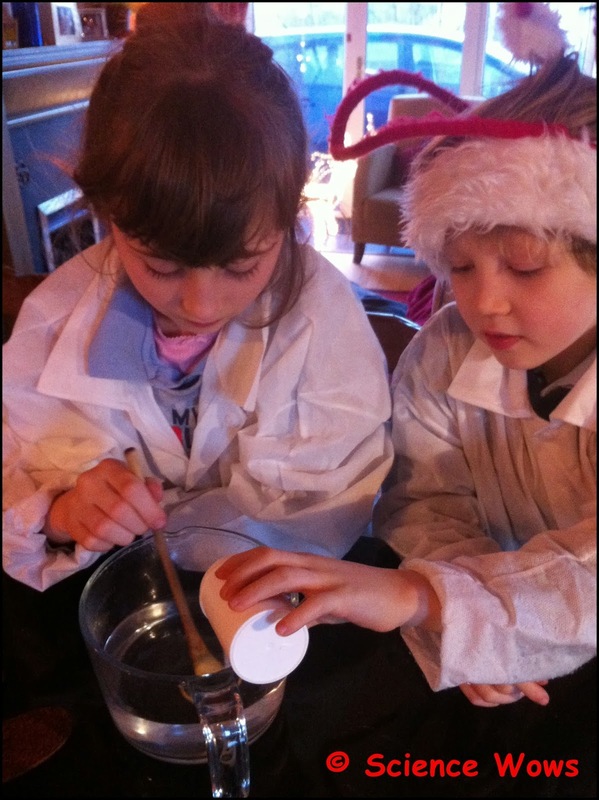 However as the water cools it cannot hold all that extra powder any more and the Borax comes out of solution. 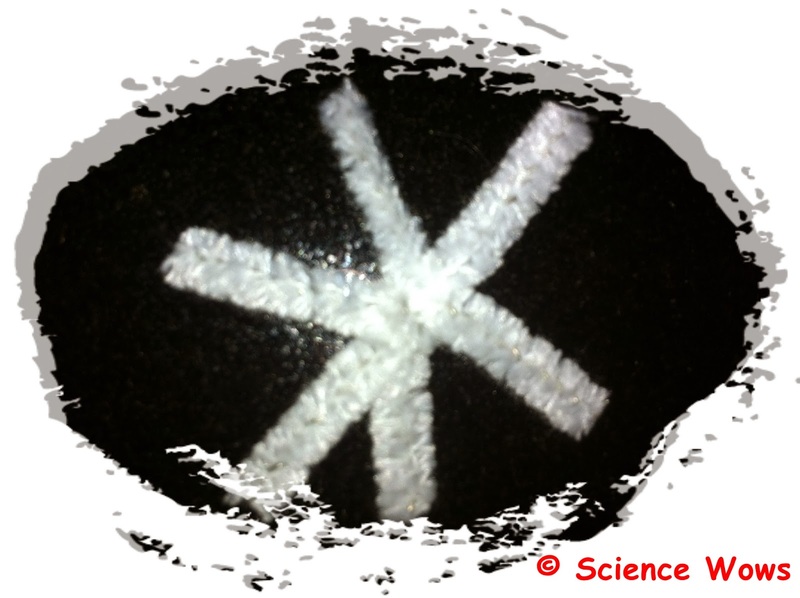 This time it comes out as a crystal and not a powder and these crystals will form if they have a structure to form on, in this case the pipe cleaner structure. A crystal is a solid structure made of an ordered 3-D pattern of atoms and molecules. Once they are given enough time and space to grow most minerals dissolved in water will form crystals. 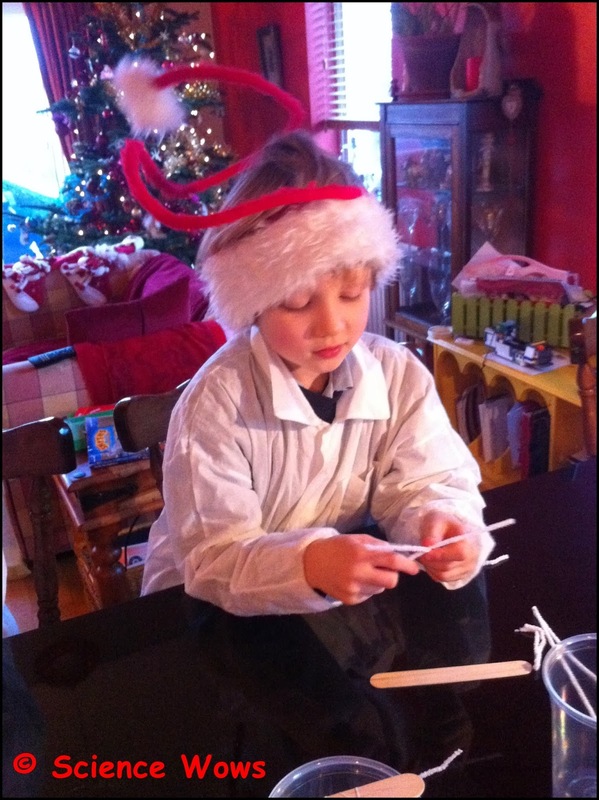 Here is our little Christmas Decoration Making 2013 Album, hope you have as much fun! We hope you enjoy this experiment and if you do get to try it out let us know how it goes for you, or even better… share photos of your own decorations with us! We have had a recent bout of coughs and colds in this house. You know how it is once you become parents… there is suddenly no subject too gory or vile for conversation. Serious discussions about nappy content, vomit content and the like are par for the course in rearing these little organic beings. Hubby and I had one of these conversation in bed the other night…. yes, 13 years together and romance is obviously still very strong between us! Under normal, healthy circumstances we produce mucus in the lining of our nose, sinuses, mouth, airways, lungs and digestive tract. This mucus is deliberately made by the body and acts to lubricate the airways and also to trap any invading viruses or bacteria, or any dust or other particles. 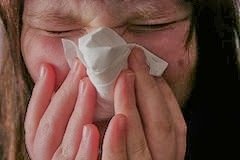 Mucus is made by the cells lining the airways. Our bodies typically make about one to one and a half litres of mucus a day. Most of the time the mucus in our airways is fairly clear and stringy. However, when the airways come under attack by infection the body sends in its army which includes cells called nutrophils. These nutrophils attack the infecting bacteria or viruses, killing them with their chemical warfare. They secrete an enzyme that contains iron and it is the iron that gives the mucus its wonderful array of colours from yellow, orange brown and the most common… green! I haven’t posted any Mystery Creatures in a while, think it is time to get back into this regular slot again so here is this week’s …. 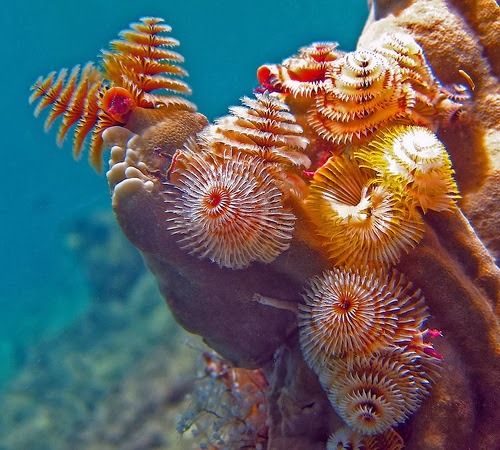 do you know what these creatures are?